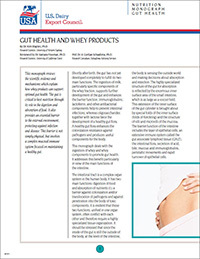 Presents the value of whey proteins and whey derivatives in the maintenance of gut health. Providing a comprehensive review of the latest research, this 12-page monograph discusses whey's benefits to the main functions of the intestine and its efficacy in the treatment and prevention of disease. Also explores the impact of whey, lactose and other dairy minerals on several gut health factors such as barrier function, microbial activity, physico-chemical conditions, enzyme activity and nutrient absorption. Also available for free download in Chinese (Simplified) │Japanese.